Making food in a slow cooker (aka crockpot) is supposed to be quick and easy. While some slow cooker recipes are great, the prep can be too much. 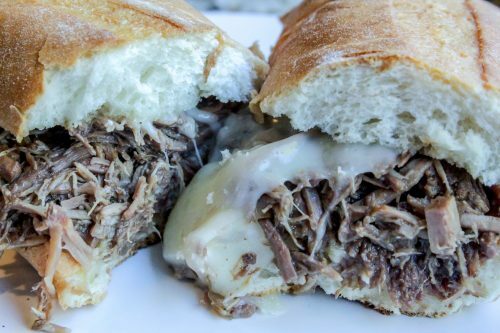 This slow cooker french dip sandwich recipe is perfect for the working parent, and has absolutely NO prep. I should also mention that it is amazing, and my 2.5 year old crushed her sandwich. If you are a parent of a toddler, you know how exciting that is! 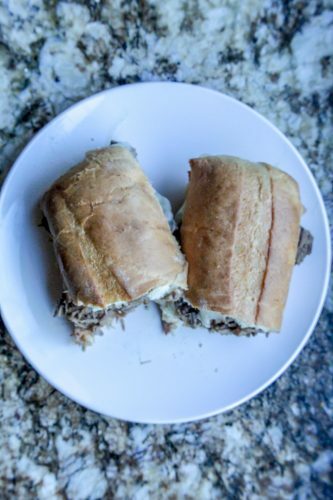 To get started with this slow cooker french dip sandwich recipe, I highly recommend going to Costco to get your beef. No this is not sponsored! Costco usually has a great selection of meat, with a good amount, for a reasonable price. Whenever I’m cooking with red meat, I’m very particular. I don’t want a crazy amount of fat, I want most of it to be trimmed, and I want it to be the exact cut I’m looking to use. Any variations of those can greatly change the taste and texture of the recipe! I highly suggest using chuck roast for this recipe, and to lay it flat on the bottom of the crockpot. Keep reading to get the recipe! 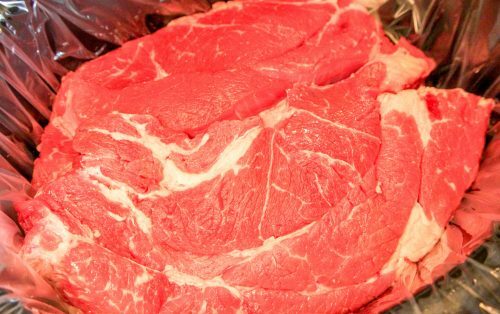 If you aren’t sure what to look for when shopping for red meat, there are a two main tips to follow: Look at marbling and color. Marbling is the white running through the meat. Yes, it is fat. But, unlike the ‘fat cap’, which has the chewy texture, you won’t notice the marbling, once it’s cooked. It actually adds flavor and tenderness! The color of meat, even just for slow cooker french dip, is important. You want rich pink or light cherry. I will admit, in a store, in a picture or at home it can alter how the color appears. This is one of those best judgments that you have to make! Place chuck roast in slow cooker, and pour soup and consummé over the top. Cook on low for 8 hours or high for 4 hours. Once meat is starting to fall apart, shred to desired thickness. Place cheese on open roll, and bake at 350 degrees for 5 minutes or until cheese is melted. Remove from oven, and add meat. In order to make the Au Jus, cup or ladle out juice from crockpot. Transfer it to a small saucepan, and bring to a boil. Reduce it to a simmer, and let reduce halfway (about 10 minutes). Like this post? Read another slow cooker recipe here!